Well, today is Emma's first official day of Summer Vacation and she's not really looking forward to it. You see, I screwed up and scheduled a dentist appointment today - and not just any dentist appointment, but she's getting a cavity filled. Yukk! SO not fun for her. And to top it off, it's raining here today. A lot. So that means no pool this afternoon. Guess I'll be buying her a milkshake somewhere to make up for it. If she can drink it that is............ I'm certainly not earning Mother of the year award today! Oh well, maybe a little stamping therapy later will at least help me feel better! LOL! The card I'm sharing today is my version of several cards I'd seen recently online and I liked the idea of it so much, I decided to do one too. I don't know about you, but I have a hard time making cards for solemn occasions. There are many times I want and NEED to send them, but it's so much easier to create something bright and fun or soft and sweet. I really like this card because it sets the right tone for the message I'm trying to send. That's been key for me when I sit down to create a card, even if it's not an easy occasion. I think of the person and the circumstance and try to tailor both my colors and design for them. This one's headed out to a friend in our church who's been having a difficult time. It suits them and the sentiment is just what I needed to say. The card is a pretty easy one. The card base is Crumb Cake cardstock. 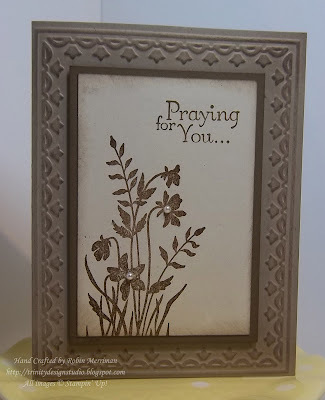 I ran the card front through the Big Shot with the Framed Tulips Embossing Folder then sponged Crumb Cake Classic Ink all over the embossing to emphasize the raised areas. The focal layer is stamped on Naturals Ivory Cardstock and matted on Soft Suede cardstock. I sponged both of those layers with Crumb Cake Classic Ink as well. The stamping was done with Soft Suede Classic Ink and I used the Just Believe Stamp Set for the design. The greeting comes from the Thoughts and Prayers Stamp Set. These cardstock layers were adhered to the card front with Stampin' Dimensionals. For a final touch, I added some self-adhesive Pearls to a couple of the flower centers. So there ya go, a toned down card for a dreary, rainy Monday. Hmmm......maybe I should have posted something cheerier! Ok, tomorrow. Tomorrow I'll post something bright and cheerful, so come back to see. Hey, if you need the supplies to make cards like this one, you can visit my Stampin Up! Online Store anytime, 24/7. Just click here: Robin's Online Store and click the SHOP NOW button at the top right. I've got a supply list for you below.